There are a number of convertible seats. The most common brands are the Britax Marathon 70-G3 , the Garco My Ride 65, Dionon Radian RXT and Maxi Cosi Pria 70 Convertible Car Seats. When selecting a good convertible seat the main features are ease of use, safety , the lower anchors and tethers for children (LATCH) type, ease of cleaning, comfort and side impact protection. Maxi Cosi Pria 70 Convertible Car Seat is a type of seat that changes from a rear-facing seat for small babies to a seat that faces forward for toddlers. The ability of the seat to convert makes it suitable for children from the period of birth to when they are around 50 inches tall. The Maxi Cosi Pria 70 Convertible Car Seat is developed based on the side impact technology. The technology is effective in reducing the impact of forces that may affect the child during driving. The impact of the forces is reduced by immediate release of air. The product is adjustable making it fit toddlers and infants of various sizes and ages. The product has advance crash management systems based on FlexTech construction system that makes them appropriate for buffering children against sudden impact. 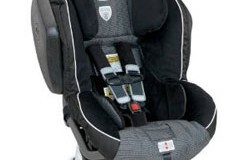 Maxi Cosi Pria 70 Convertible Car Seat is easier to adjust and install. The product’s main attribute is its optimized fit. The Maxi Cosi Pria 70 Convertible Car Seat has optimized fit for small babies and small cars. This not only adds as a safety feature but also makes the product meet the customers use. The weight of a Maxi Cosi Pria 70 Convertible Car Seat is 24 pounds and its dimensions are 21.2 x 29.5 x 22.8 inches. This makes the product heavy compared to other convertible car seats. The product comes in total black and walnut brown. The fabric used to make Maxi Cosi Pria 70 Convertible Car Seat is smooth and comfortable for the baby. The seats allow a 3 position recline for the baby. Maxi Cosi Pria 70 Convertible Car seat has a four star rating with respect to safety, ease of use, comfort, LATCH and slide impact protection. Summary : Once installed correctly, this premium car seat is worth its money.